On Lahti Science Day, Lahti UAS project manager Ms Minna Ulmala gave a presentation about the overall picture of the ENtRANCE project. It has five higher education institutions: Vrije Universiteit Brussel (BE), Lahti University of Applied Sciences (FIN), Vilnius college of Technologies & Design (LT) Wageningen University (NL) and Maiêutica (ISMAI/IPMAIA) (PT) as partners. The project has been funded by Erasmus+ Strategic Partnerships with three years plan from 2018 to 2020. The goals of the project are to enhance the societal responsibility of HEIs’ students and staff and increase the co-operation with civil society organizations (CSO). She explained the phases of the project which are: Impact study (2018), Needs study (2018), Training framework (2018 – 2019), Case studies (2019 – 2020) and Handbook (2020). Ms Ulmala presented that Lahti UAS wants to develop a co-operation with CSOs in Lahti area in which Lahti UAS will facilitate students, lecturers, researchers and civil society organizations (CSOs) to team up to find solutions for the actual problems faced by civil society. Lahti UAS will assist CSOs by delivering scientific research and by offering development project support. As such societal challenges will be put on the research and co-operation agenda. The forms of co-operation are workshops, surveys, interviews, thesis and research and development projects. The needs of a CSO will be found out in a meeting with CSO’s representatives. There will be discussion about how Lahti UAS students can support CSOs with their challenges and create new possibilities to their work. After that the forms of the co-operation, a schedule and the contact persons will be decided. 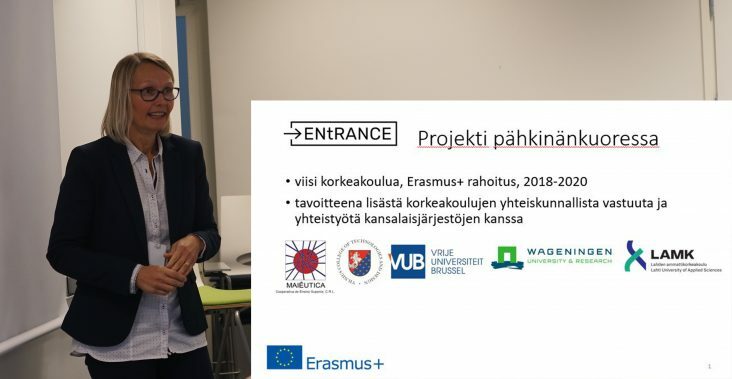 After that Ms Sanna Vihersaari – ENtRANCE research assistant, presented the main results of the impact and the needs to study which are the two main phases of the project. You can read about them in the “Finland’s Conclusion” on the Output page.